Through branded profiles and the personalized “My News” feature on the new Digg, publishers are hoping that building up followers who view them as a preferred or trusted source will enable them to reach a larger number of users on a regular basis. This is particularly appealing for publishers with content that may be of interest to specific audiences as opposed to the wider Digg user base. Will it work with local news? NBC is trying to find out. In my post on news sites on the new Digg I noted that NBC has created a series of city-specific profiles to target local markets. There are 10 local profiles for owned & operated stations around the country. These are anchored by the main NBC Local profile that highlights the best local content with a better chance of having a wide appeal. Q: Are the 10 O&O station profiles managed by you or each station individually? Lauren: The ten profiles are a joint effort between myself and the social media lead in each of the 10 markets. Since the new Digg is so, well, new, we’re still figuring out the best way to stay active. Q: Is all content from the sites being automatically submitted or just select stories? Lauren: As of now, the content from the sites is automatically submitted using a feed from our front page. Q: Creating separate profiles for each market seems like a good approach since the content is location specific. But how have users responded so far? Has there been interest/demand for market-specific content? Lauren: I think it’s still too soon to tell how people are responding – the new Digg is still picking up steam and I don’t think users have really figured out the best way to get what they want out of it. Since the new Digg prioritizes a more personal connection to what you’re digging, we think that users will enjoy seeing local news in their “My News” feed. 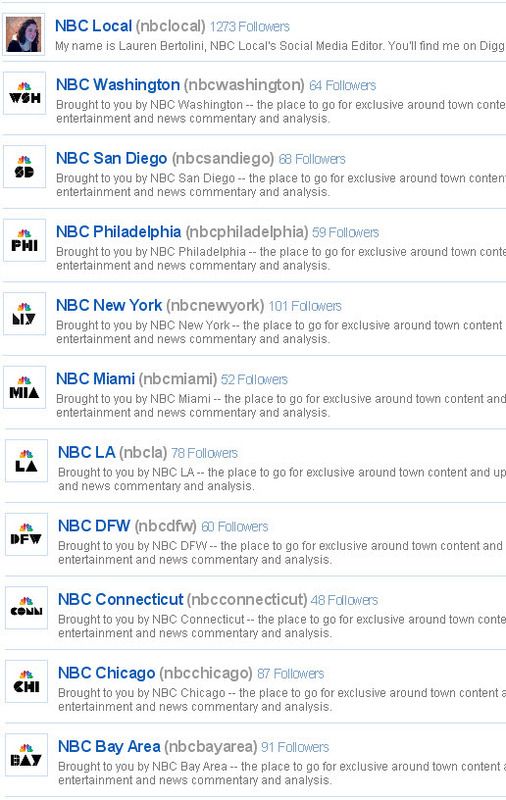 Q: The main NBC Local profile has attracted a fair number of followers. What are your aims for that profile? 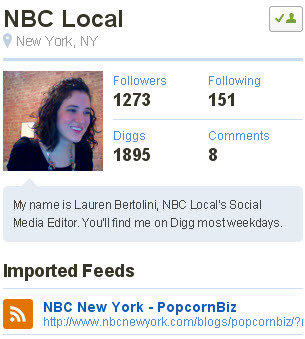 Lauren: Our team started the NBCLocal account a little over a year ago because we wanted to be part of the Digg community in the most transparent way possible, and we wanted to connect the national and international Digg community with interesting local stories. It serves as an aggregator of our best local content. A lot of the quirky stories that show up in Digg’s “Offbeat” section are really local news items when you think about it, and we felt that a lot of our content fit into what the Digg community already finds interesting. As can be seen it is still early days for the new Digg (at the moment it is still in alpha) so NBC and other news sites are still in the initial phases of experimentation. For the time being at least it has more followers than CNN, although it is important to note that to-date CNN does not appear to be actively managing its profile (see additional note #3 on my new Digg post). 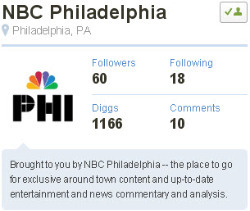 As for user activity, in going through all of the NBC Local profiles most of the automatically submitted articles have not attracted a high volume of diggs. But that is the case for many of the news media profiles that are auto-submitting, so at this point it does not provide much insight into the viability of NBC’s market-specific approach. Once the new Digg moves out of alpha and has some time to gain traction we’ll get a better sense of how interested users are in drilling down on specific sources, topics and locations. I’ll do a follow-up post when there is more data to report on.